Acute pain in cats is most commonly associated with trauma or postoperative pain. Other causes (eg, lower urinary tract disease, pancreatitis, inflammatory bowel disease, cholangiohepatitis, pleuritis, upper respiratory tract infections, and obstipation) should be investigated if the cause is not readily apparent. Risks for acute or chronic pain vary according to cause of the pain stimulus, but the risk for chronic pain increases with age. Risk for maladaptive pain increases when adaptive pain is not appropriately managed. Figure 1: Cats in acute pain hold their heads down and squint their eyes, or they may hide their heads. When in a crate or cage, they often have hunched backs and do not move around or respond to humans. Maladaptive pain develops when adaptive pain is untreated for a prolonged period, resulting in sensitization of dorsal horn neurons. Maladaptive pain may be present with or following resolution of adaptive pain. As the threshold for pain sensation is lowered, wind-up pain develops in both the peripheral and central nervous systems. Pain wind-up can worsen acute pain and cause chronic maladaptive pain. Figure 1. Cats in acute pain hold their heads down and squint their eyes, or they may hide their heads. When in a crate or cage, they often have hunched backs and do not move around or respond to humans. Signs of chronic pain in cats may be markedly different from those seen in dogs. Cats that demonstrate aggression or have pain that does not respond to opioids or NSAIDs may have maladaptive pain. Diagnosing the cause of pain is important to its elimination or, at least, to its control. Repeated examinations are vital to anticipate changes needed in pain management (Figures 2 and 3). Owners should learn the signs of pain in cats and how these differ from signs in dogs. In some cases, clinic visits for repeat examinations to assess effectiveness of pain management stress the cat extensively; the owner’s assessment of the cat’s comfort level may be employed in those cases. Figure 2: Cats with well-managed postoperative pain will look at an observer but not move away as the person approaches or touches the operative site. Mydriasis can occur secondary to opioid administration. Figure 3: This cat has a chronic condition that is well managed as seen here by its ability to rest comfortably, face outward in the cage, and not move away as an observer approaches. Compared with other species, cats have fewer hepatic phase II enzymes (such as uridine 5-diphosphate-glucuronosyltransferase); therefore, they cannot metabolize drugs that are excreted as glucuronide conjugates.8 Consequently, some dosages and dosing intervals may be very different in cats compared to dogs. For example, drugs such as acetaminophen (paracetamol) are toxic to cats. Several NSAIDs are also very slowly metabolized and should be avoided. Opioids may reduce anesthetic requirements in patients undergoing elective surgery. Local anesthetics and perioperative NSAIDs not only prevent acute pain but also decrease the risk for maladaptive pain.2 However, clinicians must account for risks associated with preexisting conditions, such as liver disease, renal disease, gastrointestinal disorders, blood clotting abnormalities, and drug hypersensitivities. For many procedures, pain continues beyond the first 12 to 24 hours. Abrupt cessation of analgesia can result in maladaptive pain and delayed healing and recovery from surgery. After the patient is stable and can eat/drink following surgery, pain management should be modified to a regimen that can be continued by the owner. This allows the practitioner to assess the efficacy of the analgesic protocol and make adjustments as necessary before sending the patient home. NSAIDs, such as meloxicam, can control chronic pain and improve quality of life for many cats. Ancedotal reports suggest that the NMDA antagonist amantadine may also be useful for treating chronic and maladaptive pain. Gabapentin, which inhibits not only neuropathic pain but also pain associated with inflammation,12 has been used with some success in cats with lumbar nerve root entrapment due to fractures or degenerative disk changes. I have also had success using it (3 mg/kg PO Q 12 H) to relieve pain associated with feline osteoarthritis. Amitriptyline, a tricyclic antidepressant, may offer another mode of treatment for chronic pain associated with osteoarthritis and inflammatory bowel disease. Due to genetic variability of opioid receptors, one opioid may work well as an analgesic in one cat but not in another.8,13,14 Following declaw surgery, an opioid (such as buprenorphine) may be more effective than an NSAID. Oxymorphone: Provides excellent analgesic effects that may be enhanced by addition of acepromazine.17 Hyperthermia is not commonly encountered at low doses. Oxymorphone may be used with intravenous medetomidine, an alpha-2 adrenoceptor antagonist, for sedation. Buprenorphine: Available as a liquid that is absorbed by transmucosal uptake; has excellent bioavailability. Analgesia can last 6 hours regardless of the route of administration. Fentanyl transdermal patches: Used in cats; however, the plasma concentrations achieved are variable; some may never achieve an analgesic concentration.18 Cats must be monitored closely for signs that pain is adequately controlled. Tramadol: Oral tramadol (10 mg/kg) was shown to lower minimum alveolar concentration (MAC) of sevoflurane in cats if given 5 minutes before induction; however, some cats vomited or hypersalivated following administration of this high dose.19 Further investigation is needed before it can be recommended. Oral tramadol is bitter and can be difficult to administer. Long-term meloxicam use for chronic pain in cats is not approved by the FDA (only a single dose is approved); however, long-term use at the lowest possible dose can provide improved comfort in cats. I monitor renal function, hepatic enzyme levels, and packed cell volume monthly to detect early signs of toxicity. If gastrointestinal erosions are suspected (due to decreases in packed cell volume and diminished liver or renal function), discontinuation of therapy is recommended. Carprofen: Has a highly variable half-life of anywhere from 9 to 49 hours depending on the individual cat; it is not recomended.21,22 However, it has been approved for use in other countries and may be effective when administered as a single dose. Meloxicam: A COX-2 selective NSAID that may be used for postoperative pain or chronic pain. In my experience, meloxicam combined with buprenorphine can provide adequate postoperative analgesia, and most owners are able to administer these medications at home. Studies have shown that as many as 18% of cats can develop gastrointestinal upset while receiving meloxicam, but generally these effects are not sufficiently severe to require withdrawal of the medication.23,24 Low-dose oral meloxicam has been shown to be effective for osteoarthritis pain in 85% of cases.8,25 Cats had no signs of renal side effects after 5 months of continuous use, although 4% did develop gastrointestinal upset.25 In cats with normal serum biochemical profiles, I use an induction dose of 0.1 mg/kg, then 0.1 mg per cat Q 24 H thereafter while monitoring blood analysis monthly. Ketamine: Most widely recognized NMDA antagonist. Has analgesic properties that specifically inhibit central sensitization, or wind-up pain, and maladaptive pain. Low-dose infusions of ketamine produce analgesia; however, it can cause significant hyperalgesia in cats that are not experiencing painful stimuli.26 Since effects of ketamine in cats have not been clearly defined, its use in clinical settings may not be warranted postoperatively, but it may be used as a component of anesthesia induction protocol. Gabapentin’s mechanism of action is unknown, but it has been used adjunctively to treat neuropathic and inflammation-associated pain in humans. It has also been used in combination with an NSAID to manage osteoarthritis in dogs12 and has been successfully used alone in cats for pain associated with lumbar nerve root entrapment from fractures or degenerative disk disease.28 Because gabapentin is excreted in the urine, dosage and frequency must be adjusted for patients with renal insufficiency.28 I successfully treated a cat that had osteoarthritis-related pain and chronic liver disease with a combination of gabapentin (3 mg/kg PO Q 12 H) and meloxicam (0.1 mg PO Q 4 days). Cats receiving chronic analgesic therapy should have physical examinations, complete blood counts, urinalyses, and serum biochemical profiles performed once monthly or more frequently if they have concurrent chronic illnesses, such as renal or liver disease. Treatment of the underlying condition is always the foremost concern, and response to that treatment ultimately determines the prognosis. Long-term use of any analgesic requires careful monitoring because agents used may not remain effective as the disease being treated progresses. Gastrointestinal upset, renal disease, liver disease, and other complications may develop over time and require drug doses or dosing intervals to be adjusted accordingly. Occasionally, drugs may have to be discontinued. In the future, more options will become available to veterinarians for the treatment of pain in cats; however, these drugs must be adequately investigated for safety and efficacy before they can be recommended for widespread use. Until then, recognizing pain in cats is the first challenge to overcome, followed by adequately treating that pain. 1. Guidelines for the recognition and assessment of pain in animals. Association of Veterinary Teachers and Research Workers. Vet Rec 118:334-338, 1986. 2. AAHA/AAFP pain management guidelines for dogs and cats. Hellyer P, Rodan I, Brunt J, et al. J Feline Med Surg 9:466-480, 2007. 3. Pain: Moving from symptom control toward mechanism-specific pharmacologic management. Woolf CJ. Ann Intern Med 140:441-451, 2004. 4. IASP pain terminology. International Association for the Study of Pain; available at iasp-pain.org. 5. Subjective and objective measurements of postoperative pain in cats. Cambridge AJ, Tobias KM, Newberry RC, et al. JAVMA 217:685-690, 2000. 6. Radiographic evidence of degenerative joint disease in geriatric cats: 100 cases (1994-1997). Hardie EM, Roe SC, Martin FR. JAVMA 220:628-632, 2002. 7. In vivo models of interstitial cystitis. Westropp JL, Buffington CA. J Urol 167:694-702, 2002. 8. 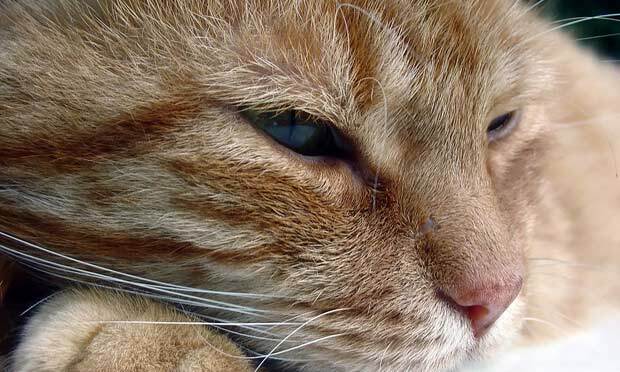 Managing pain in feline patients. Robertson SA. Vet Clin North Am Small Anim Pract 38:1267-1290, 2008. 9. Pain Management for the Small Animal Practictioner. Tranquilli WJ, Grimm KA, Lamont LA—Jackson, WY: Teton NewMedia, 2000. 10. Pain management in cats—past, present and future. Part 1. The cat is unique. Taylor PM, Robertson SA. J Feline Med Surg 6:313-320, 2004. 11. Management of osteoarthritis in cats. Hardie EM. Vet Clin North Am Small Anim Pract 27:945-953, 1997. 12. Other drugs used to treat pain. Gaynor JS. In Gaynor JS, Muir WW (eds): Handbook of Veterinary Pain Management, 1st ed—St. Louis: Mosby, 2002, pp 251-260. 13. The genetic mediation of individual differences in sensitivity to pain and its inhibition. Mogil JS. Proc Natl Acad Sci USA 96:7744-7751, 1999. 14. Use of thermal threshold response to evaluate the antinociceptive effects of butorphanol in cats. Lascelles BD, Robertson SA. Am J Vet Res 65:1085-1089, 2004. 15. Effect of route of administration on the thermal antinociceptive actions of hydromorphone in cats. Robertson SA, Wegner K, Lascelles BD. Proc World Cong Vet Anes, p 106, 2003. 16. Contribution of morphine-6-glucuronide to antinociception following intravenous administration of morphine to healthy volunteers. Murthy BR, Pollack GM, Brouwer KL. J Clin Pharmacol 42:569-576, 2002. 17. Effects of hydromorphone or oxymorphone, with or without acepromazine, on preanesthetic sedation, physiologic values, and histamine release in dogs. Smith LJ, Yu JK, Bjorling DE, et al. JAVMA 218:1101-1105, 2001. 18. Comparison of pharmacokinetics of fentanyl after intravenous and transdermal administration in cats. Lee DD, Papich MG, Hardie EM. Am J Vet Res 61:672-677, 2000. 19. Effect of orally administered tramadol alone or with an intravenously administered opioid on minimum alveolar concentration of sevoflurane in cats. Ko JC, Abbo LA, Weil AB, et al. JAVMA 232:1834-1840, 2008. 20. Comparison of the effects of buprenorphine, oxymorphone hydrochloride, and ketoprofen for postoperative analgesia after onychectomy or onychectomy and sterilization in cats. Dobbins S, Brown NO, Shofer FS. JAAHA 38:507-514, 2002. 21. The pharmacokinetics and effects of intravenously administered carprofen and salicylate on gastrointestinal mucosa and selected biochemical measurements in healthy cats. Parton K, Balmer TV, Boyle J, et al. J Vet Pharmacol Ther 23:73-79, 2000. 22. Pharmacodynamics and enantioselective pharmacokinetics of carprofen in the cat. Taylor PM, Delatour P, Landoni FM, et al. Res Vet Sci 60:144-151, 1996. 23. Feline osteoarthritis: A prospective study of 28 cases. Clarke SP, Bennett D. J Small Anim Pract 47:439-445, 2006. 24. Evaluation of the clinical efficacy of meloxicam in cats with painful locomotor disorders. Lascelles BD, Henderson AJ, Hackett IJ. J Small Anim Pract 42:587-593, 2001. 25. Long-term safety, efficacy and palatability of oral meloxicam at 0.01-0.03 mg/kg for treatment of osteoarthritic pain in cats. Gunew MN, Menrath VH, Marshall RD. J Feline Med Surg 10:235-241, 2008. 26. Effect of low dose ketamine on thermal thresholds in cats. Robertson SA, Lascelles BD, Taylor PM. Vet Anaesth Analg 30:110, 2003. 27. Amantadine in a multimodal analgesic regimen for alleviation of refractory osteoarthritis pain in dogs. Lascelles BD, Gaynor JS, Smith ES, et al. J Vet Intern Med 22:53-59, 2008. 28. Adjunctive analgesic therapy. Lamont LA, Tranquilli WJ, Mathews KA. Vet Clin North Am Small Anim Pract 30:805-813, 2000.